We started the week with beautiful spring weather and that looks to continue for the next few days. Highs in the mid 70's with lows in the lower 60's can be expected tomorrow and Wednesday. However, springtime also can mean the potential for strong thunderstorms and we'll see that possibility later this week. By Wednesday afternoon there is a chance of showers and thunderstorms, which become more likely later that night as an upper level disturbance moves through. 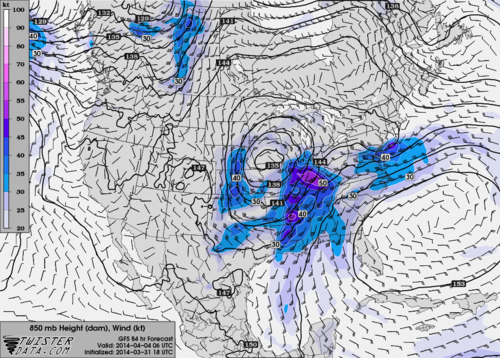 All activity is associated with a deepening surface low to the west and eventual cold frontal passage this weekend. Showers and thunderstorms on Wednesday should remain below severe limits. The time frame for greatest concern is Thursday night when the best dynamics for severe weather are in the Mid-South. 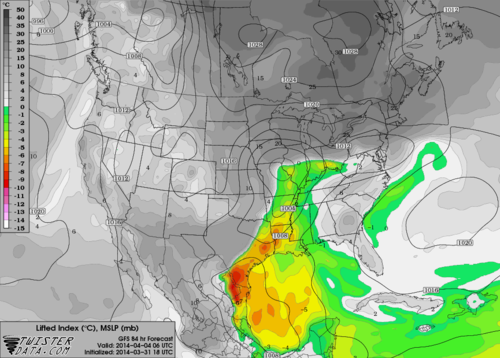 Perhaps the most important ingredient for severe storms is low level moisture. 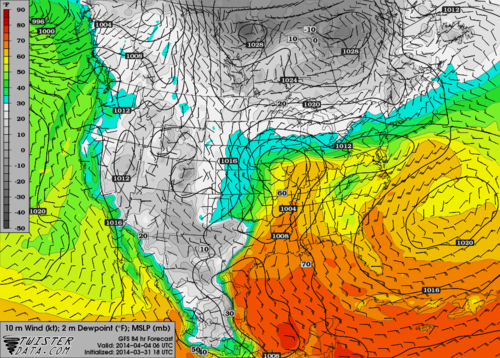 Surface dew points in the mid 60's Thursday night are plenty high to fuel thunderstorms. 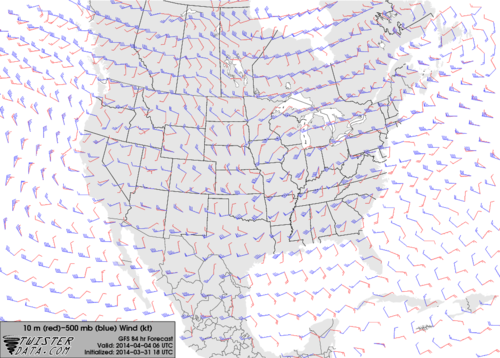 Another thing to note are the near surface winds out of the south, an important ingredient for tornado potential. Winds near 5000 feet could be as high as 40 to 50 knots. These winds can be brought down to the surface in thunderstorms. An increase in wind speed and direction with height is also a vital component for potential tornadoes. This map shows wind speed and direction at the surface (red) compared to 18,000 feet (blue). Memphis has about a 90 degree shift in wind direction and 40 to 50 knot change in wind speed between these levels. We call this deep-layer shear which is vital for potential tornadoes. Lastly this map shows the lifted index which is one indicator of atmospheric instability. Negative values indicate unstable air which is present in the Mid-South at this time. This means the atmosphere should not have any problems forming thunderstorms. In summary, the threat of severe weather is still several days away and we cannot nail down exact details at this time. However, the potential for severe weather is definitely there with all types of severe weather possible. Although I talked specifically about ingredients necessary for tornadoes, we are still not sure until we get closer that this will be a primary threat. Hail and straight line winds will certainly be possible with storms Thursday and Thursday night. A Severe T'storm Watch has been issued until 2am for all of northwest MS, including all metro counties, as well as Fayette County in west TN (map below). Shelby County is NOT included in the watch as the cold front has inched down about to I-40 and the risk of severe weather is not as high along and north of the interstate. A few reports have come in of small hail in the past hour here in the metro, though, and that could continue, though we expect the larger hail and any damaging wind to be south of the TN/MS state line. Follow us on Facebook and Twitter for the latest. Severe T'storm Watch until 2am for the pink counties. A Severe T'storm Warning was also in effect for Tunica County at the time this image was taken. 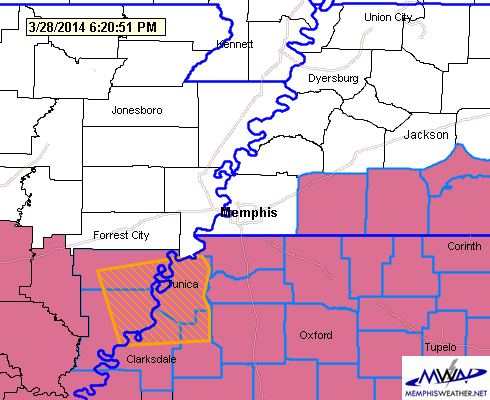 The first Mid-South Severe Thunderstorm Watch has been posted until 10pm. Covering mostly southern AR, the Mississippi delta, northern Louisiana, and the ArkLaTex, it also includes Tunica County on it's far northeast corner. Expect another watch box later for the rest of the metro. Timing of storms appears to be anytime after 5pm for southwest portions of the metro and 6-7pm for the rest of the metro, including Memphis and Shelby County. Strong to severe storms containing large hail and strong, gusty wind to 60 mph are the most likely severe weather threats. Plan your evening around where you'll go if severe weather strikes and how you'll receive your severe weather information. Of course, we'll keep you updated throughout via social media and our apps (links below). Below you'll find a video forecast discussion I produced around 10:30 this morning dealing with the potential for severe weather in the Mid-South tonight. It runs just short of 10 minutes and covers the situation well. T'storms are expected later today, beginning with a chance by the evening rush hour, becoming likely after 6pm (maybe as late as 8pm). The storms will continue for several hours, ending in the midnight time frame with showers possible for a few more hours after that. A Slight Risk of severe weather exists for the Mid-South with the greatest threat of severe storms south and west of the metro. However, damaging wind (50-60 mph or higher) and large hail (1"+) are possible with any storms in the metro. The tornado risk is very low, but not zero. Cooler and less humid weather expected this weekend, though not unpleasant except for the breezy north wind on Saturday. Highs in the 60s. Warmer weather (70s) returns next week, as well as another potential severe weather period Wednesday-Thursday. It's too early for details - stay tuned. Many of you may be at AutoZone Park tonight for the Redbirds/Cardinals exhibition, or otherwise away from home and TV. Have a way to get severe weather warnings (the MWN app with StormWatch+ properly programmed is our recommendation) and also have a plan where you will be in case you need to get under cover. We'll be nowcasting via Twitter and Facebook so you can have the latest information as well. Don't rely on that for precision warning information however. Only the app can provide that. Also, if you're planning to watch NCAA Sweet 16 games tonight on TV, EXPECT to see a crawl going at the bottom of the screen on WREG as a severe weather watch could very well be issued. Hopefully there is no need to break into programming for severe weather, but don't say I didn't warn you. Stay safe tonight, enjoy the weekend weather, and welcome to spring!! Following freezing temps metro-wide this morning, nothing near that cold is in the extended forecast that goes into early April. Thus we will assume that winter is finally retreating! Even "well below normal" temperatures at this point will have a hard time reaching 32 degrees assuming we don't approach it in the next week. So, we bid adieu to one of the coldest winters in some time and turn our attention to the weather spring brings - thunderstorms. And we won't wait long! A strong cold front and low pressure system will move from the Plains into the Great Lakes over the next 36 hours, setting the stage for thunderstorms in the metro and even the possibility of severe weather across the Plains and into the western portions of the Mississippi Valley on Thursday afternoon and evening. In fact, we'll feel the effects of the potency of this system tomorrow in the form of southerly wind that gusts up to 30-35 mph. A Wind Advisory is in effect for the entire region. 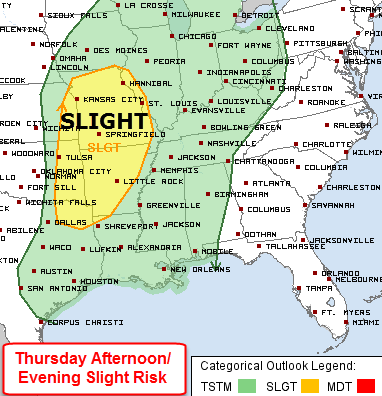 The Mid-South sits just east of a slight risk for severe weather as the storms will likely be in a weakening state as they move through our area Thursday night, owing to decreasing instability as the sun sets and better atmospheric dynamics as the low goes well to our north. However, rain and thunder are likely beginning Friday afternoon and into the night (especially before midnight). A Slight Risk of severe weather exists to our west Thursday and Thursday night. Storms will be weakening as they approach the metro Thursday night. Expected rainfall between 7pm Thursday and 1am Friday from the NAM computer model. A half inch or so or rain is a reasonable expectation. Much of Friday should be mainly dry as the cold front sags across the region and upper-level support moves away. However, low pressure will develop to our west along the front and move just south of the Mid-South on Friday night. This will bring another round of likely showers and thunderstorms, mainly after dark and into the wee hours Saturday morning. The Mid-South is currently under a Slight Risk of severe weather for this time period with the main threat being large hail. While the chance of severe weather is possible, we feel this situation is also borderline, especially with the surface low tracking south of the region. It's something to keep an eye on though. Unfortunately, the timing couldn't be worse for a sold out exhibition game between the Memphis Redbirds and St. Louis Cardinals at AutoZone Park Friday night! 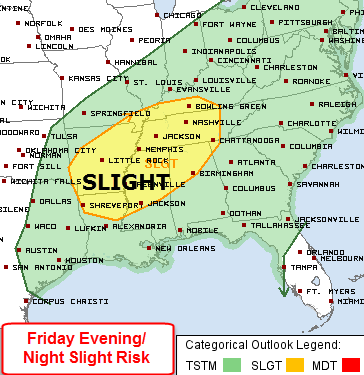 A Slight Risk of severe weather exists for the Mid-South on Friday night. Hail would be the primary threat and the threat area will be updated several times prior to Friday evening. Forecast instability from the NAM computer model valid Friday evening at 10pm. These values are plenty sufficient for thunderstorms across the area. 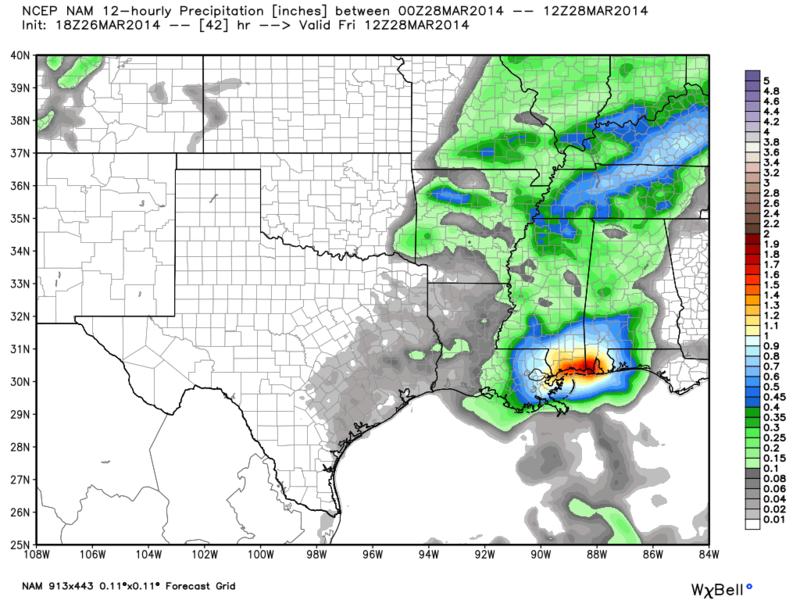 Forecast rainfall amounts overnight Friday night from the NAM model. Another half inch of rain is possible on top of Thursday night's rain. Storms should be out of the area by sunrise Saturday and a dry and not unpleasant weekend is in store with highs in the 60s and lows in the 40s. Next week looks mild overall with 70s likely multiple days and only a slight chance of rain Monday then better chances by mid-week as another springtime weather system approaches. 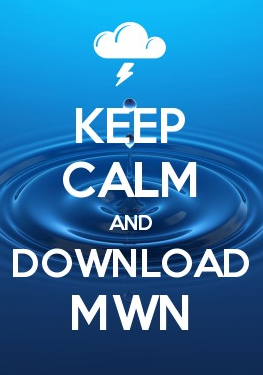 You can find the complete MWN Forecast here or in our mobile apps. Lastly, readers of this blog are getting the first look at a "draft" version of a new product MWN is developing that will help our readers and followers know when hazardous weather is possible, what the chances are, and how severe the impacts potentially could be. For now, we're calling it our "Memphis Metro Significant Weather Outlook" and today's outlook is posted below. We would LOVE your feedback! It is in testing and we're open to any and all suggestions. You can drop your comments to us on social media or comment on this blog. We promise to consider all suggestions. This is likely NOT the final way we'll present this outlook, but the one below IS valid for the next 3 days. Thanks for your input and for reading the blog! We're excited at the prospects of not having to talk about winter weather on this blog again for many months! We've been enjoying beautiful springlike weather lately and this looks to continue with one more fantastic day in store today before the weather begins to make significant changes. We'll start the weekend out with rain and cloudiness from one cold front before another stronger frontal passage makes for quite a chilly start to the week. 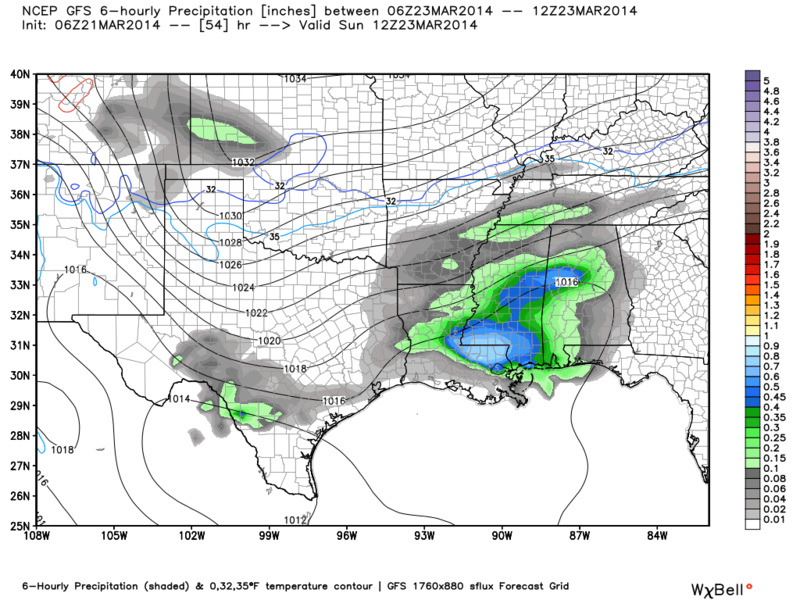 Let's take a look at some specifics via the GFS weather model. 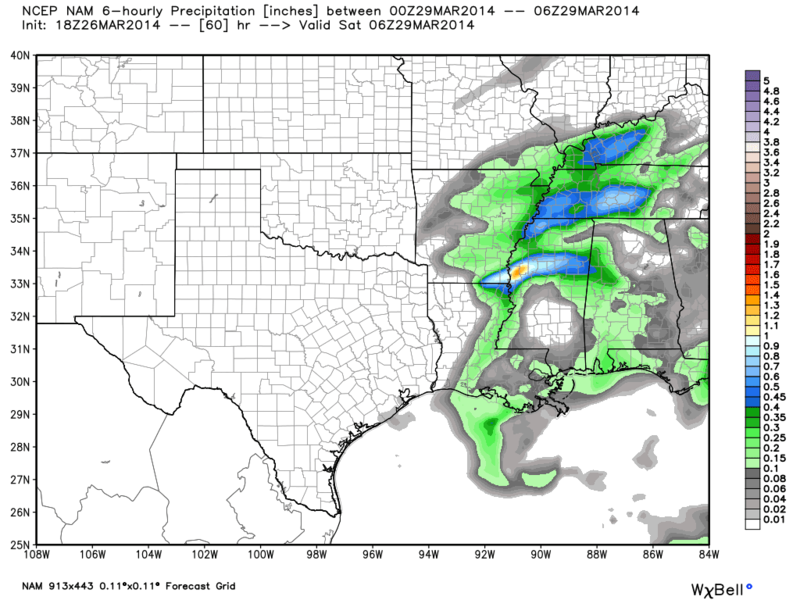 GFS model precipitation between 1-6am Sunday, About 1/4" of rain is expected. A low chance of showers appears late Friday night into early Saturday with the first front that will knock highs down from the 70s Friday to the lower 60s Saturday. Then on Saturday night we see precipitation associated with the next approaching cold front occur within the Mid-South. We're not expecting a whole lot of rain with this front with totals of less than a quarter of an inch depicted by the GFS. However, behind this front, temperatures will remain in the 50s Sunday with a gusty wind that will make it feel much cooler - and a far cry from the 70s of today. 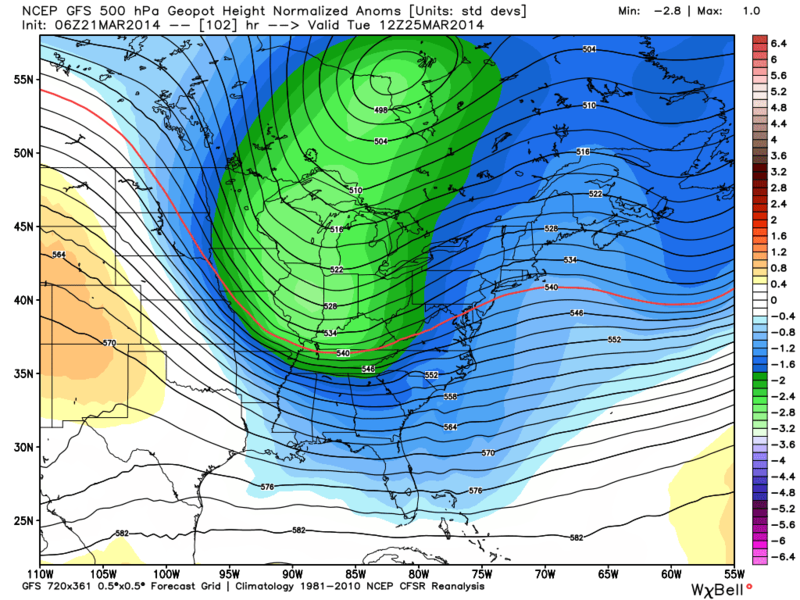 GFS height anomalies (departure from normal) at 500 mb (18,000') valid at 6 AM Tuesday. Upper level pressure is well below normal from Canada into the Mid-South. Monday remains cool, but likely dry, but moving on to Tuesday, we see a large trough (area of lower pressure in the upper atmosphere) spread across the eastern US. This indicates cold air streaming into the region from Canada, making conditions a good deal cooler this time of year than we normally experience. GFS surface temp departure from normal valid at 7 AM Wednesday. The eastern half of the nation looks to be much colder than normal on Wednesday morning courtesy of the upper level trough. 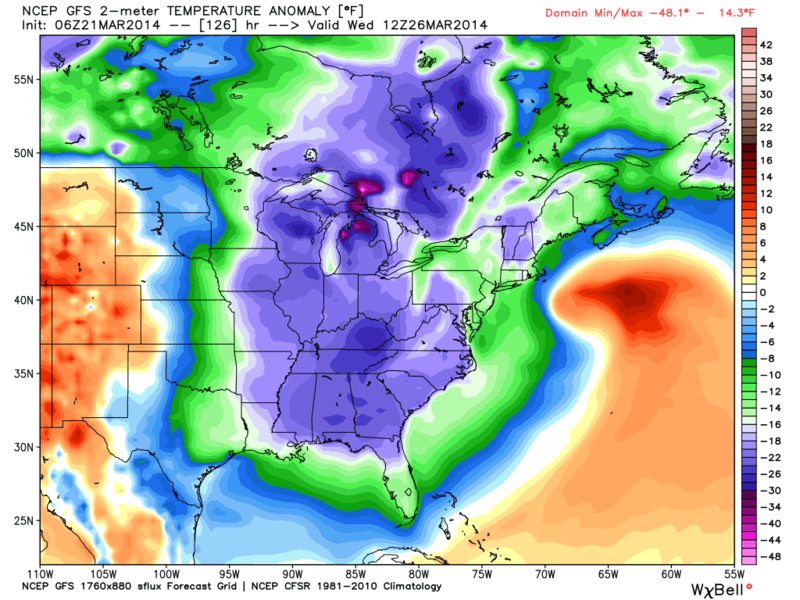 By Wednesday morning the entirety of the eastern US is engulfed in abnormally low temperatures for late March. The GFS suggests that the Mid-South will see temperatures more than 20 degrees below average Wednesday morning, which would put the region near freezing with frost likely on Bradford Pear and daffodil blooms. While not bitterly cold winter air, it is definitely quite cold for what is supposed to be early spring. The average last freeze for Memphis occurs March 22, so this would only be a few days later than normal (IF this were the last freeze of the spring - and we certainly hope so!). Lastly we have a near-surface wind map which shows winds speedily coming into the Mid-South during the day Tuesday from the north. This is the cause of such cool temperatures for late March. We should probably be glad that we aren't further north as the system you can see above off the South Carolina coastline will likely end up being a late season Nor'Easter that could bring strong wind and cold rain or snow to the Northeast U.S. late next week! You can check out the full MWN forecast here, although most are not too excited to hear that winter is not giving up just yet! I've seen and heard lots of complaints about the "return" to winter today in the wake of yesterday's cold front, especially with spring break in the rearview mirror and the latter half of March out the front window (and my #NoMoreWinter campaign notwithstanding). With cloudy skies and a breezy north wind, temperatures struggled into the upper 40s, or about 15 degrees below average, across the metro today. High pressure moves to our east tonight, allowing wind to switch from the south. Temperatures will respond accordingly tomorrow with highs in the 60s. In fact, the 60s, and even 70s, will continue through the week. 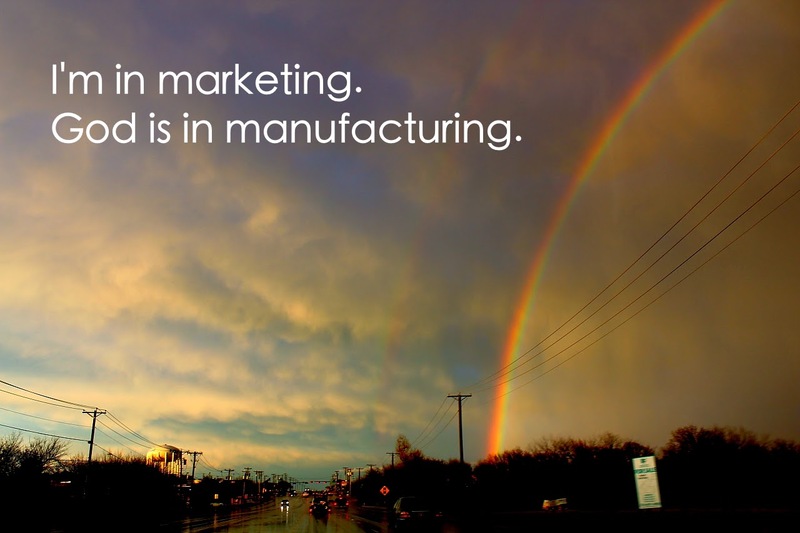 Thanks for the awesome graphic, and message, that describes our job so succinctly, Kevin! Did you know that a ban on the word "tornado" was lifted on this date in 1952 after nearly 66 years? The ban was started by the Army in 1886 (the Army handled forecasting at that time), when it was determined that the harm done by predicting a tornado would be greater than that done by the tornado itself (emphasis added). On this date in 1952, the new Severe Local Storm Warning Center issued its first "tornado watch". Follow us on social media via the channels below for more interesting factoids and a four-times-daily nowcast to help you plan your day and be prepared for whatever Mother Nature plans to throw at us! 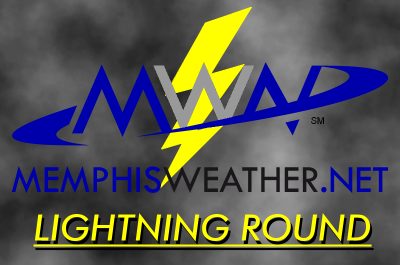 We introduced the MWN Lightning Round about a week ago to provide small bites of weather info that we think would interest our readers. Today's edition focuses on just how cold it's been so far this year, when (typically) the coldest of the air is behind us, and a quick look ahead at an unsettled weekend. Also according to the NWS, we're fast approaching our usual "last freeze date" - or the date that (on average) we see our last 32 degree reading of the spring. 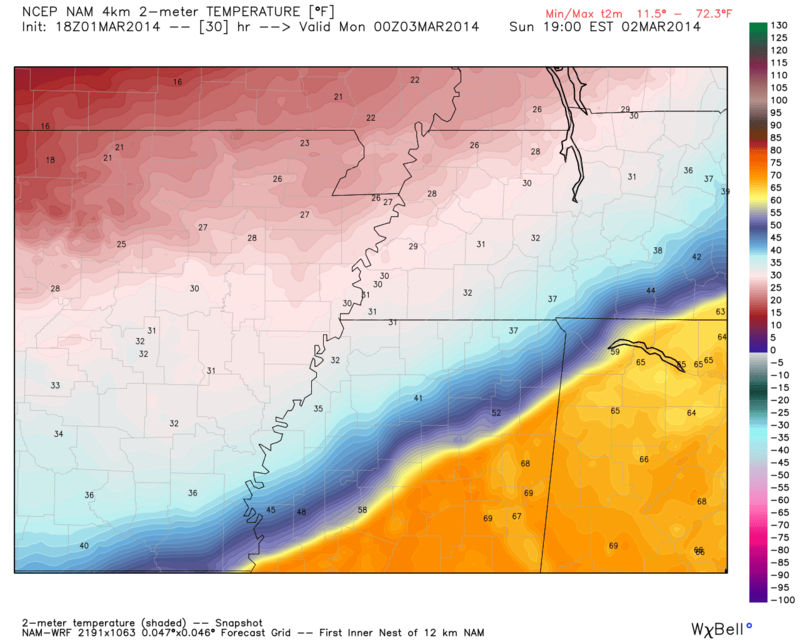 For Memphis, that date is March 19 (and according to the MWN Forecast, we may get close to freezing again on Monday/St. Patty's Day, so that is not unusual). Though the climate record is not nearly as long, the Agricenter's average last freeze is March 28, so folks in outlying areas especially still have another couple of weeks when a freeze is not at all unusual. Spring cold fronts often bring a shot of cold, dry Canadian air that can drop temperatures to 32. The good thing about cold weather in March is that it typically doesn't last long. As a perfect segue from the cold weather talk, this weekend's rainy but mild weather will be followed by a brief cold spell. As an example of the typically-brief cold spells discussed above, the low Monday morning will be near freezing, but by Tuesday afternoon we'll be well into the 60s again! Until then, though, we'll be dealing with a series of disturbances/low pressure systems that will track through the region. While temperatures in the mid to upper 60s are expected this afternoon and tomorrow, rain (some of it occasionally heavy) will move over late Saturday into Sunday morning. It appears we may get "dry-slotted" for part of Sunday as the drier area around the low moves overhead, but wrap-around precip will follow Sunday evening and overnight as strong northerly wind picks up and temperatures fall. We expect all precipitation to be gone by the time the coldest air arrives early Monday morning, but Sunday night could be cool and wet, and definitely breezy! Highs Sunday will be near 60, but could begin falling on that strong north wind by afternoon. If you have weekend outdoor plans, get them done on Saturday morning or early afternoon when rain chances are lowest. Again, check out the MWN Forecast for details on this weekend's forecast. Multi-model average of temperatures through Monday morning. Forecast hours along the bottom, starting at 7am Friday (so 24 = 7am Saturday, etc. ), temperature scale along the left. This average shows temps into the 40s by Sunday evening after remaining in the upper half of the 50s Saturday night. After a few lovely days we will be reminded yet again that the cold isn't quite done yet! However, you'll be pleased to know that the impending cold front is not of the arctic variety. Enjoy the rest of today as the front plans to make its appearance tomorrow morning and temperatures will struggle to rise in its wake. Lets take a look at the cause of the cold front and its impacts on the Mid-South tonight and tomorrow. 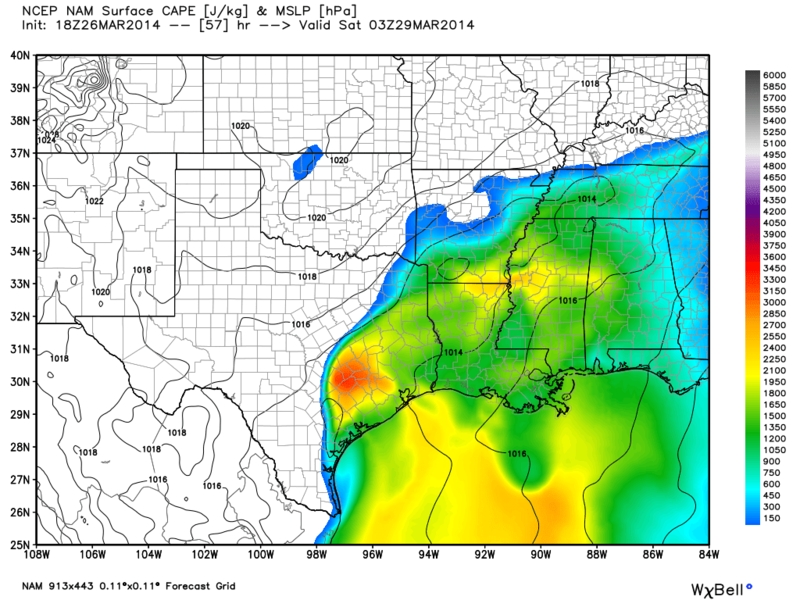 GFS 3-hr precip total, sea level pressure and 5000' temperatures valid at 7AM Wednesday. The above depiction of sea level pressure and precipitation by the GFS model shows a low pressure to our northeast by 7AM tomorrow. This indicates that we will not have much to deal with in the way of precipitation with the front as the majority of the best lift and moisture remain closer to the low pressure system itself. Lets zoom into the Mid-South with the use of a high-resolution model. NAM 4-km Composite Reflectivity ("Future Radar") valid at 4AM Wednesday. 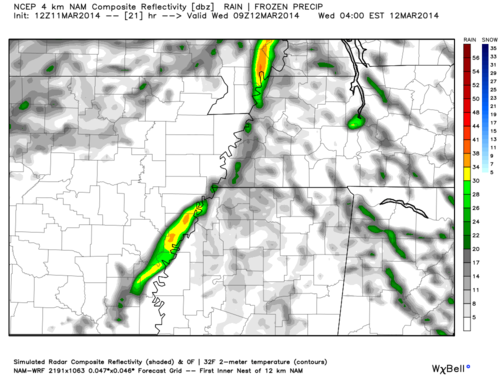 The NAM model suggests a brief shower is possible in the early morning hours as the cold front makes its way through the Memphis metro. A shower is also possible overnight while we remain in the warm, relatively unstable air mass. 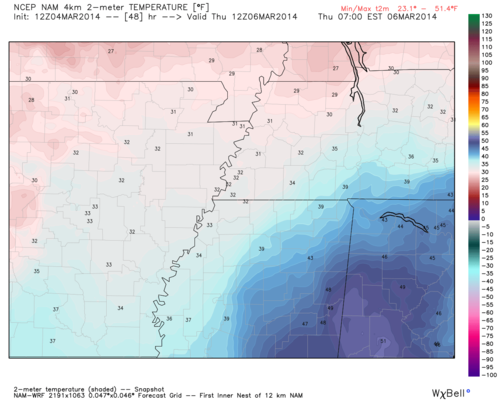 4km NAM near-surface temperatures valid at 6AM Wednesday. By 6AM the difference in temperature east and west of the Mississippi River is quite dramatic. This shows the potency of the cold front as it progresses east during the morning hours. Expect a drastic drop in temperatures into the 40's around this time tomorrow morning. 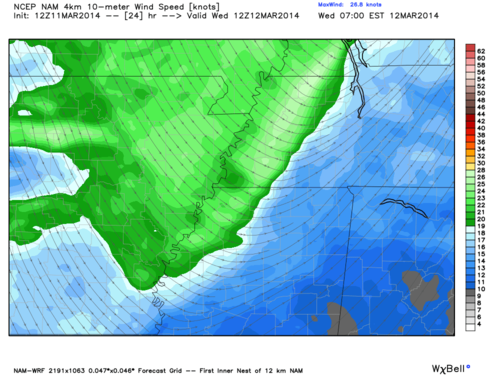 4km NAM near-surface wind speed and direction valid at 7AM Wednesday. The NAM also shows a distinct wind shift to the northwest typically indicative of a cold front. This occurs as the low pressure to our north progresses eastward, wrapping air around it counter-clockwise. As a result it will be quite windy tomorrow, especially in the morning, making those 40's feel quite a bit colder. Expect decreasing clouds as well as cold, stable air works to reduce cloud cover. Looking out a little further, temperatures will rebound behind the front as we head towards the end of the week, but not quite to the levels of the past couple of days. In addition, mornings will be colder as cool, dry high pressure moves overhead. For details, reference the full MWN forecast at our website. The MWN Lightning Round debuts! Today marks the debut of a new feature of the MWN Blog we're calling "The MWN Lightning Round." We hope to publish The Lightning Round a few times a week (that maybe optimistic, but hopefully at least a couple times), though it will not be on a set schedule. The nature of The Lightning Round won't necessarily lend itself to a set schedule. Nearly every day, we come across an item or two that we think you'd enjoy, but which we don't have a good way to share with you for whatever reason. So in this feature, we'll touch briefly on a number of subjects, which could include quick forecast updates or commentary, vignettes, a cool pic, a weather-related article or story, a little Weather 101, a mythbuster, or just something we want you to know about. Most will have a Memphis or Mid-South connection, but some will be just be cool weather-related stuff that we think you'll like! The number of items in each lightning round will vary, but we'll aim for 3-4 to keep it from getting too long, while allowing you to explore deeper into each topic via links to other sources, if applicable. The goal is to provide a little more information than we have been covering on the blog in the past, but are more than we would typically get into on Facebook or Twitter. We'll still provide the usual blog fare - including forecast discussions leading up to weather events of significance separately, recaps of said events, in-depth commentary, climate recaps, etc., but this will hopefully keep your appetite for MWN content satiated between these other posts! Since it's new, we want your feedback! If you have an idea for a topic that would go well in The Lightning Round, send it to us on social media or leave a comment in any blog post. If you hate the whole concept, let us know. If you enjoy it, let us know that too! 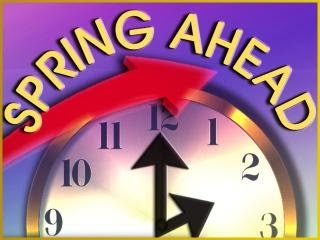 Tonight at 2am CST, we spring forward and it magically becomes 3am CDT. Most people set their clocks before going to bed, but some stay up until 2am just to see an hour pass by in a second (as if an hour doesn't seemingly pass by in that amount of time nearly every day at some point). A few places in the U.S. (Arizona and Hawaii most notably) still don't change their clocks twice a year like we do, and I think they're onto something. For me, year-round DST would be just fine. The only major drawback for meteorologists (who use Greenwich Mean Time, aka Zulu time, aka military time, aka UTC time) is that the major computer models come in an hour later, as they are run on UTC time. It's also easier in the Central timezone to convert UTC to Standard Time than Daylight Time, but I'll get over it to get an extra hour of daylight in the evenings. Also remember that clock-changing time should also be battery-changing time for your smoke detectors and weather radios, both of which we highly recommend. For more on the history of Daylight Saving (not Savings) Time, see this article. William hails from the Memphis area, having graduated from Arlington High School in 2009 and has been a fabulous addition to the MWN team the past year. I know you appreciate his hard work on our social media channels, as well as frequent blog posts, as much as I do. Congrats William on this well-deserved appointment! Next Thursday, March 13, from 6:00pm-8:00pm, MemphisWeather.net and Mid-South Storm Chasers will jointly host one of two storm spotter classes scheduled for the Memphis area this spring. The class, which is free and open to the public and does not require pre-registration, will be held at Bartlett United Methodist Church, 5676 Stage Road in Bartlett, west of Bartlett Blvd and in front of Bartlett High School. Taught by the National Weather Service, the class will cover the basics of storm development and features of severe weather, how to spot and what to look for, common "look-alikes" to severe weather, and most importantly, how and what to report. The class is for all ages, but especially for pre-teens and up. 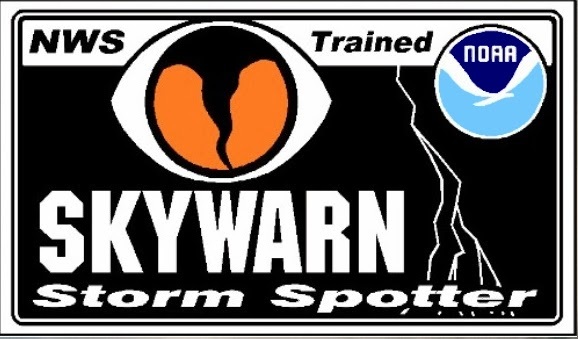 At the end of the NWS-led class, yours truly will lead a short session on using Twitter and the #mSpotter hashtag to report severe weather via social media, with reports relayed immediately to the NWS. The #mSpotter program has been very successful in the past couple of years with the rise of social media use and I'll provide details on how you can participate. If you have an interest in weather or it has been a couple of years since your last spotter class, plan to join us Thursday night! A list of other classes scheduled across the Mid-South can be found here. That's it for this edition of The MWN Lightning Round! Let us know what you think or if you have ideas for topics to explore by commenting below. Although this is probably the last thing you want to hear right now, winter weather is possible yet again Wednesday night into Thursday morning. 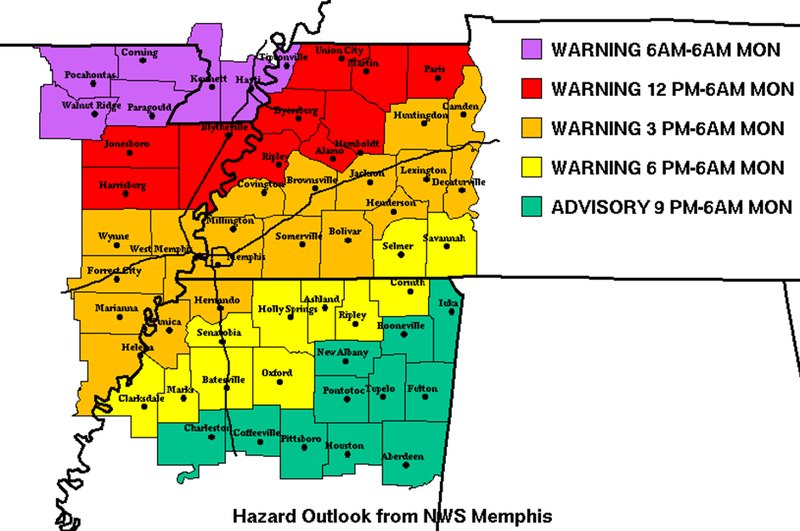 On the bright side this threat is very minimal and we do not expect any major impacts in the Memphis metro area. However, the potential is high enough that we are obligated to inform you of the possible impacts. Wednesday night an upper level trough will move through the region while parts of the metro could be right around the freezing mark at the surface. We expect any precipitation that falls to be liquid, so we will have to watch temperatures very closely (especially in areas that have already had a lot of snow/ice). The chance of frozen precipitation at this point is low and we expect any activity to be light. The most likely form of winter precipitation (if not rain) will be light freezing rain or freezing drizzle. 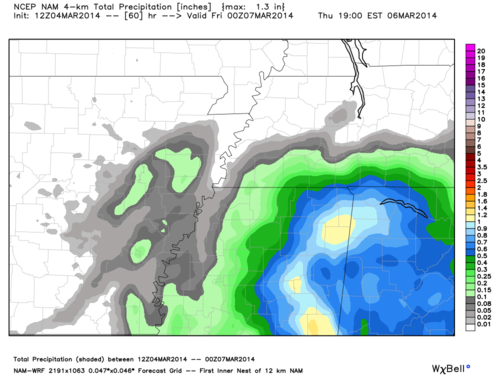 12z NAM Total Precipitation through Thursday evening. One high resolution model run has the bulk of the precipitation to our southeast, with light amounts around the metro. Most model runs have been drier than this, but it does indicate the possibility of some precipitation through Thursday morning. The model also shows temperatures right at the freezing mark throughout the metro early Thursday morning. We believe this is a bit cold, as the model overestimated the previous winter weather event and "thinks" snow pack is over most of the Mid-South, but it's worth monitoring. However, any areas in Tipton, Crittenden, and parts of Shelby county with left over snow/ice Wednesday will have to watch their temperatures more closely Wednesday night as that lingering ice pack helps keep the temperatures lower. These are the areas that will be impacted the most if they happen to get some freezing precipitation. Areas that have seen more melting will likely stay above freezing and could see some cold rain. As always just a few degrees will determine what falls in the Mid-South, but thankfully we are dealing with little moisture. As a result we expect only minor impacts, if any, but will continue to keep an eye on this system and will let you know of any changes to the forecast. Following a brutally cold January, February offered only minimal relief. The average temperature was over 4 degrees below normal with three days remaining below freezing all day, however no temperature records were broken. There were multiple instances of light wintry weather during the month, but only one day with measurable sleet/snow. Overall, precipitation for the month was slightly above average. Severe thunderstorms on the 20th caused some wind damage in northwest MS, though several Severe Thunderstorm and Tornado Warnings were issued that day in the Memphis metro. Flash flooding was also observed in heavy rain on the 4th. Comments: Three days had high temperatures below freezing and 16 days had low temperatures below freezing. For the 3-month period of "meteorological winter" (December-February), Memphis' average temperature was 39.9 degrees, which was 3.5 degrees below normal. Comments: Two days with more than 1" of rain and the same two days with more than 0.50". The last day with measurable precipitation was the 13th. A trace of winter precipitation (not measurable) was recorded on six days with 0.3" recorded on the 8th. 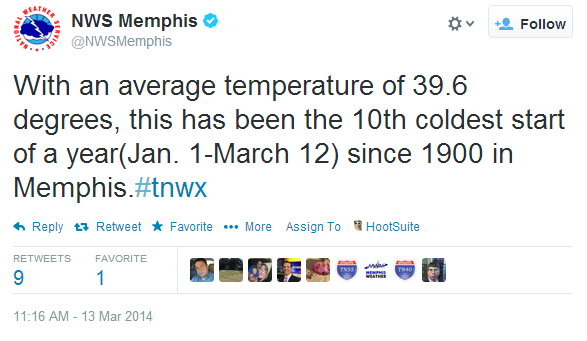 For the 3-month period of meteorological winter, Memphis precipitation totaled 12.94", which was 1.17" below normal. Snowfall from December-February totaled 0.3", which was 1.6" below normal. Comments: Three days had high temperatures below freezing and 19 days had low temperatures below freezing. Comments: Two days with more than 1" of rain and the same two days with more than 0.50". A trace of snow (not measurable) was recorded on four days with 0.5" on the 8th. Auto-updating current temperatures across the metro. Auto-updating radar imagery. Click here for precip-typed loop from MWN (or here for mobile users). Temps are finally starting to get to the freezing point in Shelby County, and as regional radar shows, there is still several hours of precipitation to go. The Storm Prediction Center issued a "mesoscale discussion" a bit ago highlighting the I-40 corridor from Little Rock to Memphis to Nashville and indicating that they are still expecting accumulating freezing rain and sleet to continue, as well as the thunder, into the nighttime hours (click the link above for the admittedly-technical details). We have backed off our ice accumulation totals a bit due to the latest changeover to ice, but maintain a good 1/2" of sleet with a little snow late tonight in the forecast. 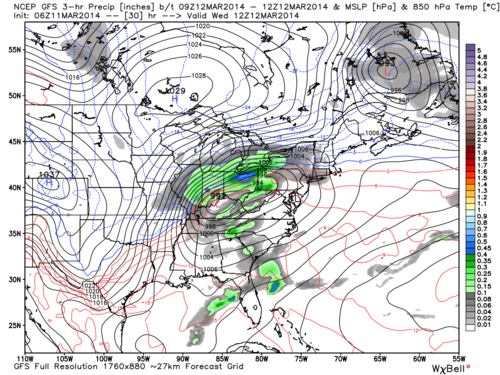 We expect all precip to be tapering off by 2-3am with just a chance of light snow or freezing drizzle after that time. Anything that falls from here on has the ability to stick to anything, including roadways. Temperatures WILL still fall into the teens late tonight and whatever is on the roads can and will freeze. Monday morning's commute could be tricky, but should be made easier by the decision of Shelby County Schools to close, reducing the traffic on the roadways. This will probably be our last blog update of the night. Stay with our Facebook and Twitter feeds for ongoing details and continuous nowcasting into the night. If you must travel overnight or in the morning, allow plenty of time, room between you and the car in front of you, and take it easy! Area of concern for SPC for freezing rain and sleet over the next few hours. Crazy amounts of rain have fallen in the past few hours, especially north of I-40. As of 6:30, MWN in Bartlett has totaled 1.79" mainly in the past few hours with temps in the low to mid 30s. We have minor ice accumulation on trees and other exposed objects and a lot of running water across the ground. The rain total here is already more than I expected for the entire event and we have several hours left to go. We've mentioned on social media that the next couple of hours are critical. Here's why: as the upper-level disturbances responsible for today's precipitation move closer, cooling typically results, especially at the upper levels. In normal circumstances, the lowest levels follow suit. In addition, the cold front is continuing to sink slowly to the south allowing colder air (in the 20s just 50 miles to our northwest) to move in. We're well into the period that freezing rain was expected and yet we sit at 33 degrees south of the Shelby/Tipton line. If we don't drop to freezing at the surface in the next couple hours, the colder air overhead (which is more predictable) will move over and we may end up with little freezing rain. HOWEVER, that cold air aloft will put us in a sleet/snow regime. Precipitation is expected to continue into the wee hours of the morning. So while we may miss our window of opportunity for ice (and is that REALLY a bad thing? ), sleet and possibly snow are still expected. Totals for the event may not jive with the forecast, but again, is that really a bad thing? For those that want ice and snow I say "it ain't over." For those who would rather avoid disaster, there's still a chance. And for those who would rather throw darts at the weather people, you'll find a way no matter what happens. We've got thick skin or we wouldn't be in this business. 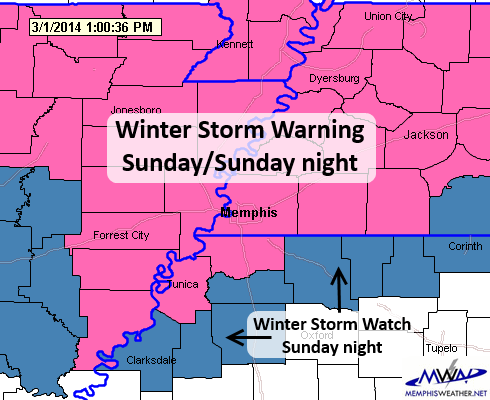 Forecast remains on track with no changes to Winter Storm Warnings. The first steady batch of precip has moved through much of the area, dropping temps to the freezing mark across Tipton, Crittenden, and northern Shelby County. Light icing has been reported in Marion, Millington, and Munford. We've also gotten some tiny icicles on trees here in Bartlett at the MWN office. The heaviest precipitation is expected after dark until 2-3am when the most significant ice is expected and temps will be in the 20s. Travel is not recommended after dark unless absolutely necessary. Power outages and hazardous roads remain the main concerns with some outages possibly lasting a few days depending on infrastructure damage due to the weight of the ice. In addition, wind gusting to 30+ mph overnight will make power outage issues worse as lines weighted with ice are broken by strong wind. The wind and cold temperatures have also prompted a Wind Chill Advisory to be issued for the overnight hours as lows fall to the mid teens and wind chills drop to near zero. All preparations should be complete, including preparing for possible long-duration power outages. Be sure all devices are charged and all outdoor pets are brought in or appropriately sheltered with a water source that won't freeze. We'll continue to update as conditions necessitate. Get the latest on our Facebook and Twitter feeds. The Winter Storm Warning has been officially extended and starts now, ending at 6am Monday. Temps are still sitting in the mid 30s and will remain there for a couple of hours, likely until the first round of steady precip arrives after 3pm. It's showing up now on radar above. Forecast precip amounts remain unchanged and, in the immediate metro, look to be up to 3/4" of ice (freezing rain), transitioning to sleet later this evening (up to 1/2") and then ending as light snow (up to an inch). Sounds like a frozen treat that Blue Bunny might want to consider! North of the metro, more sleet/snow is expected with slightly lower freezing rain amounts, while north MS, especially south of DeSoto County, overall ice amounts will be a bit lower, and little if any snow is expected. The forecast is still on track. Temps fell about 25 degrees very quickly behind the cold front this morning and now sit in the mid 30s (always current metro temps above). With the initial push of cold air to the south and just light rain/mist around, we expect to stay just above freezing for a couple of hours until the deeper cold air trailing the front and escorted by upper-level disturbances arrives by mid-afternoon, which will also coincide with when the first good round of precipitation reaches the metro (latest radar loop also shown above). That precip is originating in eastern OK and western AR and will move in from the west. There is still the possibility of thunder late this afternoon and evening, which would enhance precipitation rates. The NWS has indicated it will start the Winter Storm Warning at noon along the I-40 corridor vs 3pm, but the official bulletin has not been sent yet. Everything remains on track for a prolonged period of icing from late afternoon through the wee hours Monday morning. Precip may start as rain but should quickly change to freezing rain after onset around mid-afternoon. We still expect to see a period of sleet as well, sometimes mixed with the freezing rain, but as the predominant precip type later this evening. Then, light snow will likely fall late tonight on top of the ice. Precip amounts still appear to be on track for up to 3/4" of ice/freezing rain, 1/2"+ of sleet and a dusting of snow (more from Tipton County north). These amounts are not as much as 1994 but are more than enough to cause major issues for travel, commerce, and infrastructure (power). Preparations for a significant ice event, possibly with lengthy power outages and dangerous travel conditions should be complete within the next couple of hours. Roads will initially be warm enough to stay just wet, but after sunset, especially during periods of sleet/snow, they could get very hazardous. Elevated roadways (Hwy 385, I-40/240/55 overpasses and flyovers, and bridges over water or other roads) should be avoided as soon as the air temperature reaches 32 degrees. We'll update again as conditions warrant. The best way to see the latest info is via our Facebook and Twitter feeds. We'll try and update this a few times today to provide the latest information regarding the impending winter storm that will affect the entire metro beginning later this afternoon and continuing overnight. The first question to answer is "what is the chance this will miss us altogether?" The answer is "near zero." The second one is, "what is the chance that we won't get much of anything, with only minor impacts?" The answer: "very low." 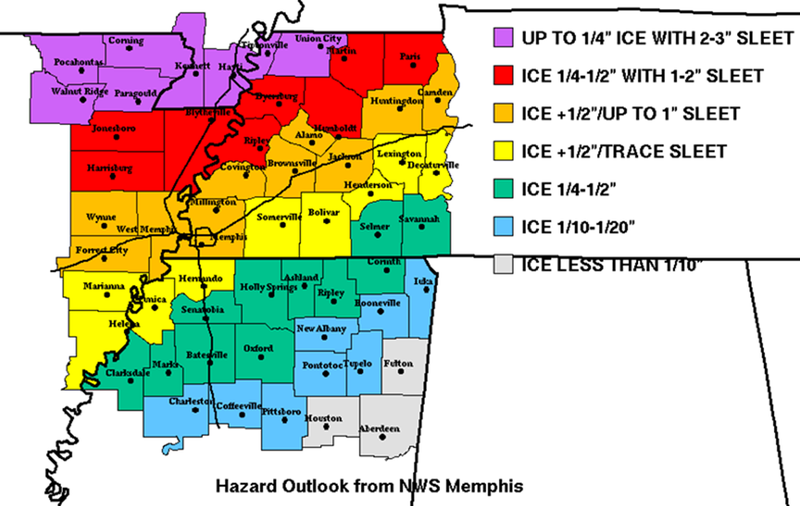 In sum, everyone in the Memphis metro is expected to see an amount of ice and sleet that will cause significant impacts to their normal routine, make travel dangerous, and could result in power outages that last multiple days in some areas. The latest graphics from the NWS on timing and accumulations are below. Winter Storm Warnings go into effect for most of us at 3pm (6pm for far southeast metro counties). NWS forecast ice accumulations for this event, beginning after the start time of the warnings indicated above. (+1/2" indicates greater than 1/2" of ice). 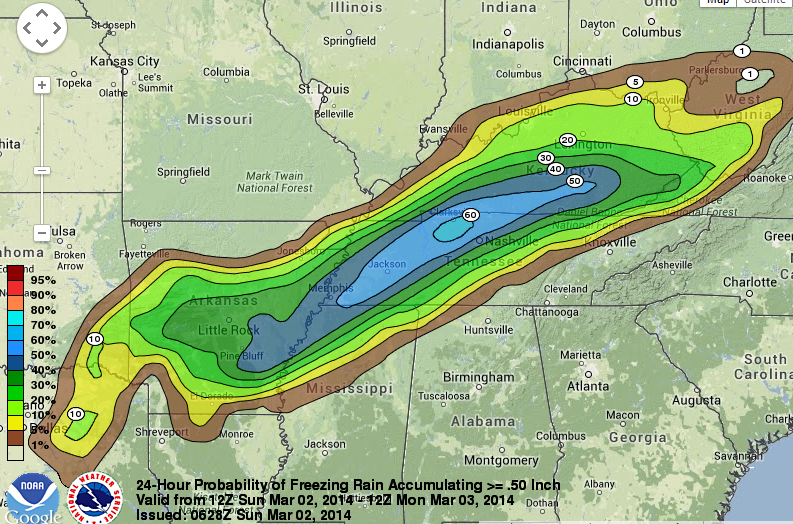 Probability of more than 1/2" of ice through 6am Monday. The metro has a 50-60% chance. This does not take into account sleet, which is expected to top the ice, followed by a layer of light snow of up to 1". At 7am, temps across Shelby County ranged from 63 at Memphis International to 49 at MWN in Bartlett. It's now 7:30 and we've dropped another 6 degrees in Bartlett. [8:15 update: Memphis dropped 20 degrees last hour, now at 43 and falling. At 8:15 in Bartlett it was 38.] Given the latest forecast models and data from the NWS, we expect the transition to freezing rain to occur around 3pm in Tipton County, 4pm in Shelby County, and 5-6pm across north MS, including DeSoto, northern Tunica, Tate, and northern Marshall Co.
Once the temp hits 32 and freezing rain begins, temps will continue to fall into the 20s. Freezing rain of 1/2" or more (possibly up to an inch) will transition to sleet, then finally after midnight, light snow, as temps fall well down into the 20s. A dusting to 1" of snow is expected (more north, less south). Wind will be another factor overnight that could exacerbate power outages as frozen lines swing in 20-30 mph wind. Power outages are expected in many areas and could last for a few days in some areas. Road conditions will initially be OK, but within a couple hours of reaching 32 will become slick to dangerous. Elevated bridges/overpasses should be avoided after freezing rain begins. Temperatures will remain in the 20s Monday. Hazardous driving conditions will likely continue into the day Monday. Have an alternate plan for work if you are able and certainly allow plenty of extra time if you can't. Other preparations, which should be complete by early afternoon, include charged cell phones/devices, flashlights with extra batteries, pets taken care of (no frozen water dishes outside and bring them in), placing cars under cover if able and ice scrapers NOT inside the car (if the doors freeze shut) if they are parked outside, a full gas tank, whatever bread and milk and other staples you think you need for a couple of days (and don't forget water). We'll continue to post the latest throughout the day on our social media feeds linked below, as well as here as able. Visit MemphisWeather.net on the web or mobile device for the latest radar, current temps, etc. Stay safe and be prepared! Computer model data continues to indicate the likelihood of a potentially significant winter storm late Sunday in the metro. As confidence increases and models remain in good agreement as to the potential, the Winter Storm Watch for most of the metro counties has been upgraded to a Winter Storm Warning. The warning is issued when the onset of precipitation is within about 24 hours and there is a good chance of "great impacts to society and commerce." 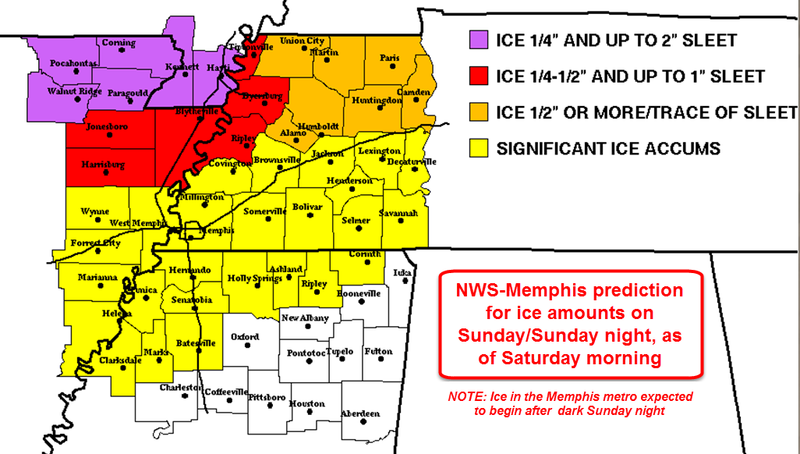 Earlier this morning, the graphic below was issued by the NWS in Memphis indicating the possibility of "significant ice accumulation" while the accompanying text stated the possibility of up to 3/4" of freezing rain and 1/2" of sleet, as well as minor snow accumulation. As new data has arrived this morning, the threat has changed little and confidence in this storm producing the greatest winter impact of the season for areas along/south of I-40, including Shelby County, remain high. In fact, as of this morning, NOAA's Weather Prediction Center puts the probability of more than 1/2" of ice by midnight Sunday night at 60% in the metro. Probability of 1/2" or more of ice through midnight Sunday night. 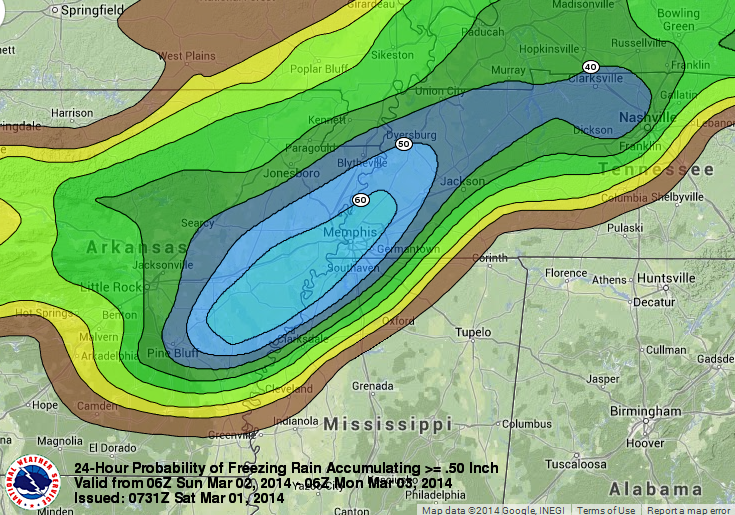 The highest probabilities also show where the best chance of significant icing will occur. 1. When will it get cold? And how are we getting ice when it's well into the 60s today? Temps will remain warm overnight (likely in the 50s), but by mid to late morning will fall as the Arctic front that is bringing the cold air slides through the area. It's not inconceivable that most of the afternoon is spent in the 30s. By late afternoon, areas north of I-40 will fall to freezing with areas in north MS dropping to freezing by early evening. Temps will keep falling, reaching the teens by Monday morning. 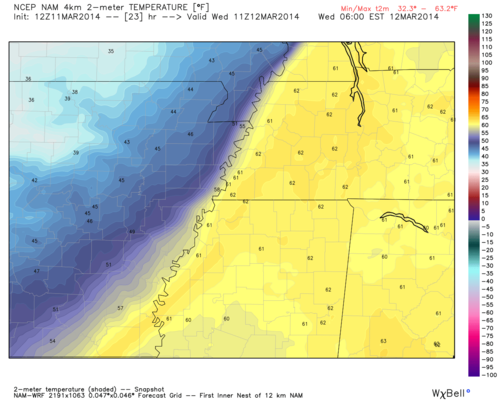 Temps at 6pm Sunday according to the mid-day NAM model, showing 31 in Memphis at that time. As to the second question, I refer you to the day before the 1994 ice storm when temps were over 70. Yes, warm ground, especially pavement, will initially delay freezing roads, but precipitation will be heavy in the evening. The harder it comes down, the easier it is to accumulate and freeze the ground. This is especially true with sleet which piles up. 2.What is causing all the precip to fall behind the front? Isn't it usually the other way around here? Yes, it usually is the other way around, or at least the precip moves out before air sufficiently cold to cause wintry precip arrives. In this case, a strong upper level trough is trailing the front and a warm jet stream of air from the southwest is flowing over the cold front to our south, producing lift necessary to generate precipitation. This is what we call an anafront, which is a cold front with most precip behind it. In fact, there will be enough lift in this storm that I would not be surprised at all to hear some thunder with temps below freezing tomorrow evening. That lift, or convection, serves to enhance precipitation rates, which is bad when it's below 32! 3. So what type of precipitation are we expecting and when? Precip will start as rain during the day but will become freezing rain as the air temperature hits 32 in the late afternoon (north) or early evening (south). We're thinking (right now) that this occurs around 6pm in Memphis, give or take an hour. As the evening goes on and colder air filters into the low levels (1000-2000 feet up), we'll see sleet develop, which will mix with the freezing rain. By midnight or so, the warm layer above the surface but in the lower layers will dissipate and we'll likely see a changeover to light snow or freezing drizzle. This entire transition process will take place earlier in Tipton County and points north than in DeSoto County and other parts of north MS, probably by a few hours. This atmospheric sounding shows that precip falls through warm air as rain, then falls into an area of sub-freezing air, which changes it to sleet or freezing rain. 4. How much are we going to get? No really. The Winter Storm Warning from the NWS mentions amounts up to 3/4" of ice, 1/2" of sleet, and a small amount of snow. From our perspective, that is reasonable. In fact, the latest runs of the 3 major models I looked at this morning all suggest that those numbers are also reasonable. Total liquid amounts of precip (including melted sleet/snow) between 6pm and the early morning hours could easily be near 1". The worst case scenario is if all of that falls as freezing rain, which created a glaze of ice on everything that would be 1" thick. The faster we switch to sleet or even snow, the better, as damage to trees and power lines would be much lower (sleet doesn't stick to objects, just accumulates on the roads and ground). 5. What impacts are foreseen with this amount of ice? Many people attempt to compare ice amounts to 1994, and for good reason. 1994 was pretty much a worse case scenario, with widespread 2"+ amounts and power outages that lasted up to 2 weeks. However, remember that it doesn't take that amount to cause widespread impacts to commerce, travel, and society. In fact, 1/4"-1/2" of ice will bring down some power lines and tree branches, while a very small amount (less than 0.10") on roadways will make them impassable without treatment. The other issue will be the wind. With gusts in the 20-30 mph range overnight, power lines with ice on them could easily succumb to the weight of the ice and snap. In addition, temperatures will remain below freezing until perhaps Tuesday afternoon. Mid-Southerners need to prepare for an extended period (a couple days maybe) of hazardous travel, as well as power outages that could last for a few days or more. All travel and preparations should be complete by 6pm Sunday night. 6. Any chance this completely passes us by? Well, technically yes. But there are no indications that we end up with nothing. 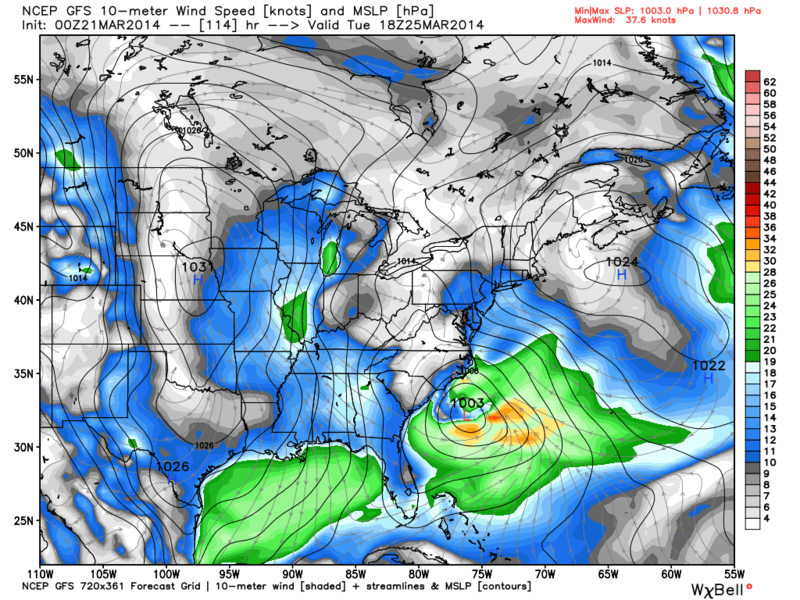 The fact that other systems have done so this winter has no bearing on this storm. No two storms are the same. In fact, the last major storm that "missed" Shelby County still has Tipton County cleaning up a few miles up the road. This setup is not the same as those, where temperatures hovered just above freezing for hours then the rain ended. 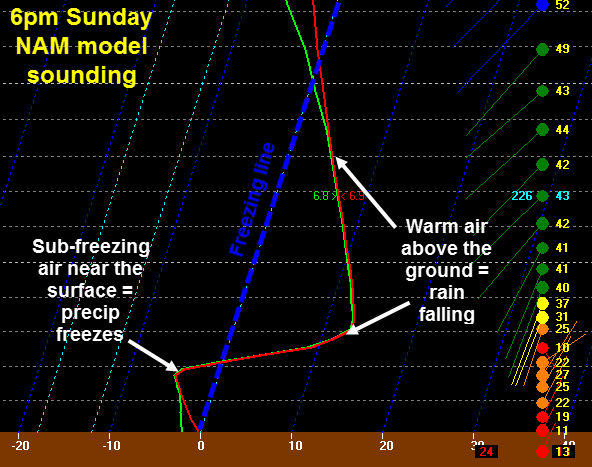 All models indicate that temps will fall below freezing with precip falling and then keep falling throughout the night. It's always better to be safe than sorry. I've cancelled a class I was to lead Sunday night due to the likelihood of hazardous weather. We'll talk about the entire situation more tonight on a Google+ Hangout that you can watch on our Google+ page, the MWN Hangout page, or YouTube at 8:30pm CST. Follow our social feeds (links below) at that time for the YouTube link. We'll also use our social feeds to bring you the latest on the developing winter storm. Invite your friends to follow along for the best local weather coverage in Memphis and share this blog with them!